Announcing the newest addition to the Honeyminer team: Notsofast. We’re excited to welcome the well-known crypto mining expert Notsofast to the Honeyminer team! Who is Notsofast? Despite pseudonymity, he has become widely known as a friendly, knowledgeable figure providing positive early experiences for all new cryptocurrency users since 2013. But most of all — he understands what’s at stake in the world with crypto — and shares Honeyminer’s vision. We are thrilled to partner with Notsofast in our mission to make mining easier for everyone. He will help us fine-tune our product roadmap, partner with large scale mining operations, and ensure we offer the very best product experience for new and pro miners alike. To get to know Notsofast, follow him on Twitter — and read below for a brief Q&A with the man himself. Notsofast, welcome aboard. Diggy: When did you get into mining? NSF: January 2014. I had a fresh bite from the Dogecoin bug, and overnight the faucets distributing coins for free dried up; yet I wanted more. I’d known about Bitcoin for a couple years at that point but was kind of turned off by the rabid libertarians sounding all crazy about it… DOGE seemed like an irreverent, fun alternative that could actually reach people more than nutty proselytizing, so I decided to invest in an AMD R9 290 GPU and pop it in an extra computer. I joined the infamous Dogehouse mining pool and figured out how to get the most out of my little rig, experimenting with tweaking clock speeds and watching the output of the mpos pool UI, fascinated that I was participating in the creation of a fun new kind of real money out of thin air! Diggy: Why do you think mining is important? NSF: Mining’s important because it is the best, longest-proven process we have to commit energy into work, and in return for the mathematical proofs we generated from that work, get back secure, trustless, permissionless, decentralized assets. Everybody who wants to commit the tools and the energy — maybe even tools they already have, like a mobile phone, laptop or a GPU — can participate equitably in a money and store-of-value network. I love me some applied economics and permissionless money really shakes things up for the better in theory. The field of economics is widely known for not being very accurately predictive in the real world, and so seeing that shake-up play out in positive ways, like the potential to replace a country’s failed economy, or circumvent unfair monopolies of things like remittances, is really exciting to me. NSF: So I like this emerging theory that the era of work is coming to an end, and we’re entering a new era: The Era of the Network. We started off opportunistically hunting and gathering. Then we leveraged agriculture to get ahead, and things got a little better. Then eventually we leveraged economies of scale with industry, and things got a little better yet again. Zooming in, this looks like, our parents had one lifelong job for a career, and nowadays our jobs are more like concurrent projects (even our side hustles have side hustles). Yet trading our time for sustenance is obviously capped at 24 hours in a day, and the rewards from this exchange still could be much better distributed amongst humans. But in the age of networks and information, our existence as individual nodes in the Network is gaining more and more relevance and value. Each of us brings a unique set of skills and resources to humanity’s Network; the advent of the internet allowed us to discover and share these skills and resources, and the advent of blockchain-based cryptocurrencies will layer a free marketplace on top of this network, allowing for unprecedentedly open flow of utility from person to person. Your personal nodemix embodies all possible utility you are willing to sell to other users of this Network. Mining is one element of that, but a foundational element, because it’s the first principle that enabled this marketplace layer in a truly equitable, trustless, permissionless way. Things may not look like this yet, but they will. 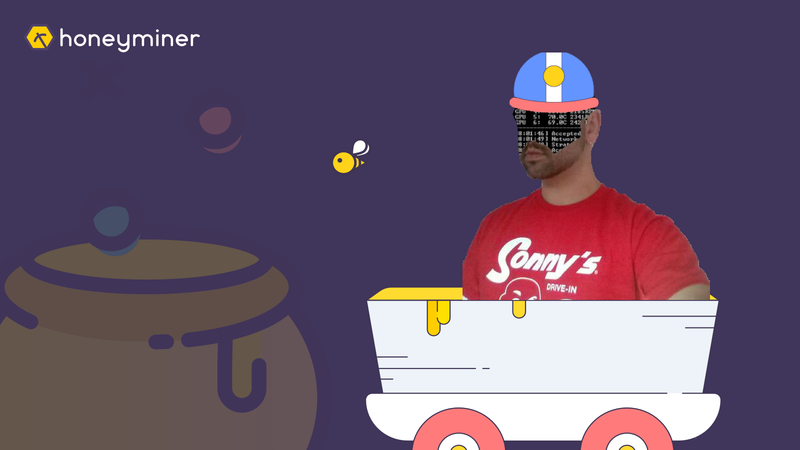 The power of Honeyminer in particular is the friendly, encouraging face it puts on your ability to commit the processing power and energy you control to your nodemix, and earn passive income rewards for that. Honeyminer in its best light is a straight up invitation to the era of Network. Please help us welcome him with a “👏” below, follow on Twitter, and visit honeyminer.com to download our application.